Recent footprinting studies have made the surprising observation that long noncoding RNAs (lncRNAs) physically interact with ribosomes. However, these findings remain controversial, and the overall proportion of cytoplasmic lncRNAs involved is unknown. 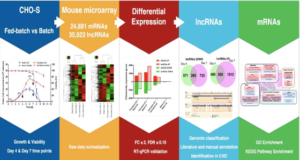 Here researchers at the IMIM, Barcelona make a global, absolute estimate of the cytoplasmic and ribosome-associated population of stringently filtered lncRNAs in a human cell line using polysome profiling coupled to spike-in normalized microarray analysis. 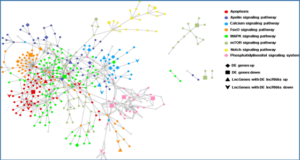 Fifty-four percent of expressed lncRNAs are detected in the cytoplasm. The majority of these (70%) have >50% of their cytoplasmic copies associated with polysomal fractions. These interactions are lost upon disruption of ribosomes by puromycin. Polysomal lncRNAs are distinguished by a number of 5′ mRNA-like features, including capping and 5’UTR length. On the other hand, nonpolysomal “free cytoplasmic” lncRNAs have more conserved promoters and a wider range of expression across cell types. 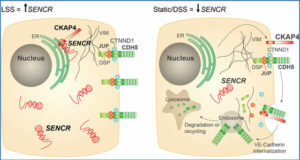 Exons of polysomal lncRNAs are depleted of endogenous retroviral insertions, suggesting a role for repetitive elements in lncRNA localization. 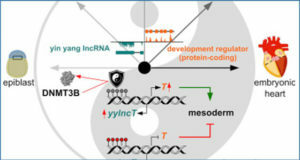 Finally, the researchers show that blocking of ribosomal elongation results in stabilization of many associated lncRNAs. Together these findings suggest that the ribosome is the default destination for the majority of cytoplasmic long noncoding RNAs and may play a role in their degradation. 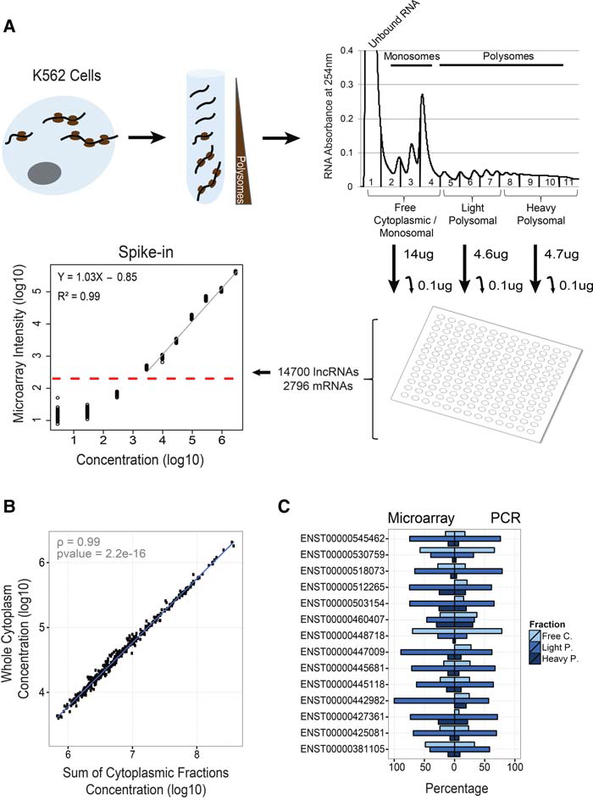 Discovery and quantification of ribosome-associated lncRNAs by polysome profiling and microarray hybridization. (A) Outline of the subcellular mapping of K562 lncRNA by polysome profiling and microarray hybridization. Sucrose-gradient ultracentrifugation was used to isolate the indicated fractions of ribosome-associated RNA, quantifications of which are displayed at the upper right. The pooled fractions used in this study are shown below the figure. 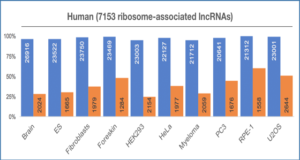 The total amount of RNA isolated from each fraction is indicated by arrows, from which 0.1 μg was collected and hybridized to custom lncRNA microarrays. Microarrays were normalized using spike-ins: At the lower left is shown a representative example of the linear regression of spike in probe intensity against their starting concentrations. Dashed red line represents the defined detection threshold for this fraction where regression ceases to be linear. Only probes above this threshold were considered detected. (B) Correlation of the sum of the three cytoplasmic fraction concentration estimates and total cytoplasmic concentration estimate, supporting the quantification approach used. (C) Barplot shows for 14 lncRNA examples the relative amount (expressed as a percentage) of transcript molecules estimated to be present in each of the fractions. Sum of percentages of the three fractions has to be 100%, the total of detected molecules in the cytoplasm. 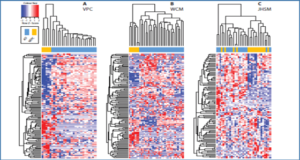 Left bars represent quantification by microarrays and right bars by the mean of two quantitative PCR biological replicates. Microarray and PCR experiments represent different biological replicates.